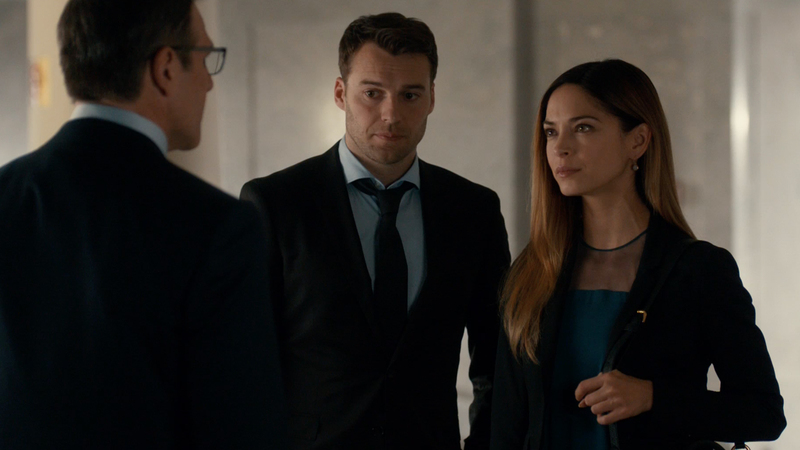 It is the season finale of Burden of Truth so will Joanna and Billy be able to defeat her father and get the girls the justice they deserve? At the end of the last episode, David filed a motion for Billy and Joanna to find evidence to prove that PNL, the parent company of Matheson Steel knew about the illegal dumping of toxic waste thus are liable. We think Crawford and Associates have their ace in the hole with the letter from the mayor but Joanna is reluctant to use it. David comes by their office to present a plea deal: $1 million to be shared amongst Molly and the three other girls to be paid out over 5 years and they must sign a confidentiality agreement. Joanna rejects the deal but Billy tells David that he will present the deal to their clients. Ben Matheson tells Taylor about the deal and asks her to talk to the girls to take the plea deal so they can put everything behind them. Taylor says she will under one condition and that is if Ben apologizes to the girls for what Matheson Steel did to them. Taylor sees that her dad is reluctant to do so. Molly wants to take the deal as she needs the money as she was about to sell her car to get much needed cash. The other girls also reject the deal. So it is off to trial they go. Before day 1 of the trial, Billy and Joanna prep their whistleblower for his testimony. He is still skittish at testifying as he fears the consequences of going up against Matheson Steel. Joanna threatens to subpoena him which only causes him to leave. The morning of the trial, Taylor catches her dad all paranoid in their shed hiding something. Taylor still wants her dad to come clean with her but he doesn’t. Taylor goes to the trial but sits apart from her father. Ben testifies that everything he did with the mill’s toxic waste was on the up and up. The whistleblower does show up and testifies that Ben paid for him to dump toxic waste anywhere he can find space in Millwood. The whistleblower tells the court that PNL knew and he was paid an extra $1000 a month to do so and to keep his mouth shut. When David cross-examines him, he questions why the whistleblower did not tell the family courts about the extra $12K he made a year during his divorce settlement. David presses on which court was he lying to. This puts Joanna in a tailspin but Billy doesn’t think it is a big deal but he does want to finally use the mayor’s love letter to David against him and asks to confront the mayor himself with it. When Billy goes to the mayor, she says that she can’t take sides in the matter but when he shows her the love letter that threatens to blackmail David unless he leaves his wife does the mayor finally decide to take a side without taking a side. You see back in the day, the mayor was a law student that worked for David Hanley and had an affair with him. The next day, the mayor drops by Crawford and Associates with paper work. We then go to Luna who gleefully serves David some papers at Lucy’s diner that compels him to be a material witness for Joanna and Billy. Why was Luna so cheerful? Well earlier after a cute almost step-father/daughter talk with Owen, he told Luna that it shouldn’t matter who her biological father is but she confront him if it matters to her. When Luna confronted David about being her father, he denies it even after Luna confirmed her parentage via a DNA test with Joanna. David still doesn’t think that proves anything and walks away but turns back to wipe any DNA evidence off his coffee cup and fork. That David Hanley sure is a swell and upstanding guy. With David on the stand, Joanna presents him with the sale documents of PNL’s purchase of Matheson Steel. Joanna gets her father to read the purchase price ($28 million) and whether or not there was a liability clause in it (there isn’t and David said there doesn’t have to be one). However, the documents the mayor presented with the team was the draft purchase documents. In the draft document, the purchase price was $30 million and there was a liability clause built in. However, the final contract had that clause remove for a cool $2 million and any mention of barrels of toxic waste. This causes an uproar in the court when Joanna tries to compel her dad to read what was in his notes in the draft contract, which results in the judge calling a recess for the next morning. Outside the courtroom, David tries to present a deal but Joanna and Billy counters with another: PNL will clean up the toxic mess and provide the town $1 million for any future clean up that needs to be done as well pay out each girl $2 million. Joanna then threatens her father with a piece of evidence against him in open court that can prove quite damaging. It is Gerrilyn’s birth certificate, which she gave Joanna earlier, that shows she was underage when she gave birth to Luna. The next morning, the judge presents to the court Joanna’s and Billy’s plea deal and asks if David’s clients accept, which he tells the court they do. The court erupts in cheers and the girls hug each other in victory while Ben hangs his head down in shame. With the trial over, David tries to reconnect with Joanna as if nothing happened but she rejects him and even ignores his calls. At the Boot Tavern, everyone is celebrating, Molly even pushes her uncle to pursue something romantic with Joanna now that the case is over. Joanna advises Gerrilyn that she can fight her father but he will find a way to win and get away with it. Outside the Boot Tavern, Taylor meets up with Joanna and wonders about her father. Joanna tells Taylor that sometimes you just have to walk away from things. Back at Crawford and Associates, Joanna is packing away the case files. Billy comes in and tries to get her to stay and join his firm as a partner because they work well together and there is clear chemistry between the two. Joanna declines because she can’t hang the Hanley name in Millwood without being vilified. Joanna tells Billy that she has accepted an offer to join a firm in Winnipeg that lets her be closer to her mom. As a new day dawns, Luna and Molly head into her car and drive off to see the Pacific Ocean (earlier Molly lamented that she has never seen the ocean). And the two have agreed to try a long distance relationship with Luna in Montreal and Molly heading to Winnipeg for a clinical trial. Elsewhere, Owen has convinced Diane to stay and finally meets her kids. And Joanna doesn’t leave town without saying good bye to Diane and promises to keep in touch. Billy gets a call about a potential client but realizes the case is too big for him to handle. We then see Taylor find a key that her dad presumably hid earlier. Taylor uses it to open up a door in the shed and discovers a bag full of cash that I presume was the $2 million that Ben pocketed to get the liability clause removed the purchase contract. We see Taylor boarding a bus bound to who knows where with the bag and we see her mom frantically making calls about her missing daughter. And in Winnipeg, Joanna arrives at her new job and when the security guard asks for her name, we learn that she has changed it to Joanna Chang. So ends season 1 of Burden of Truth but I am not quite sure if there is going to be a season 2 as everything has been wrapped up in a nice bow with no set up for a potential season 2.